I've been wondering about the Plasmat lens design. It's the staple in the large format world and very common in enlarging and process lenses, but to the best of my knowledge, was almost never used for 35mm and I'm struggling to think of any medium format plasmats either. Anyone know why this is? Meyer made some Kino-Plasmats and Makro-Plasmats for small formats in the 1920s, but don't seem to have continued with them after ww2. 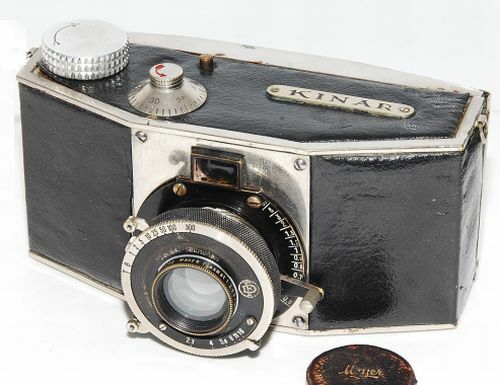 There are Kleinbil-Plasmat 5cm and 7cm f2.7 made in the 1930s for small formats but they are extreme rare. After the death of Paul Rudolph in 1935, it seems nobody continue the development of Plasmat type lens for small formats. Meyer continued for a short time after war the Makro-Plasmat in a new housing design for Primarflex. Why no small format plasmat types? They're slow. The typical plasmat for 6x9 and larger formats opens only to f/5.6. And they have eight air-glass interfaces so are somewhat flary unless coated. Remember, coated lenses for civilians started to arrive in 1946 and some makers started coating later than that. Remember, too, that the more uncoated air-glass interfaces a lens has the less light it transmits. The typical fastish (f/2 to as fast as f/1.5) normal lenses for small format have been sonnar types (six air-glass interfaces, on offer in the '30s) and, with the major exception of f/2 Xenons, which were in use in the '30s, 6/4 double Gauss types and derivatives after coating arrived. What puzzles me is that no one complains much about flare from uncoated f/2 Xenons or TTH's uncoated double Gauss type cine lenses. The alternative explanation, that 6/4 lenses cost too much for most users in the '30s, is hard to rule out. But even coated, plasmat types are slow. I don't see any reason why plasmats have to be slow, Meyer made fast f1.5 and f2 ones, Ross made an f3.2 one in the 1940s. Also, a 6/4 plasmat has no more air-glass surfaces than a 6/4 double-gauss/planar which became the staple of 35mm photography. Ian, re fast plasmat types, the VM shows some cross-sections. They don't match the cross-section you posted. When Meyer used the word plasmat, it was a trade name, not a design type. I know that the VM is fallible. Do you have a better source? Re plasmat types made by Ross, the VM describes a 20"/6.3 one, doesn't mention any f/3.2 Ross lenses. I know, the VM is fallible and Acrobat Reader search for f3.2 will miss variant ways of writing f3.2. Starting in the '30s, Boyer made f/3.5 Saphir Bs in focal lengths from 50 mm to 95 mm. These are the fastest plasmat types (your cross-section) I'm aware of, and aren't very good. The VM mentions a number of miniature camera applications of various Meyer "Plasmats," most of them different from your cross-section, in the '30s. There has to be a good reason why Rodenstock and Schneider, both merchant lens makers who made lenses for 35 mm and larger format cameras after the war offered plasmat types only for larger formats. As far as I know their customers offered plasmats only on cameras with movements. I can't think of a camera without movements for a format larger than 35 mm that was offered with a plasmat type lens until fairly recently. Can you? For that matter, although dagor type lenses were offered on smallish format cameras (can you think of a 35 mm camera that had one? I can't.) between the wars, after WW-II that type disappeared except for process camera and LF applications, faded away and was replaced by plasmats (your cross-section, not any of the other Meyer trade names). The last dagors to be discontinued were Boyer's Beryls and Emeraudes, and since the end of Boyer the only new dagor types to come to market have been Schneider's Fine Art XXLs. I just skimmed Cox' symmetrical lenses section, turned up two small format plasmat types, Cox' parlance S3. 28/5.6 Summaron and Steinheil's 35/4.5 Orthostigmat. Can you find more elsewhere? The cross-section is from wikipedia, it's merely a generic diagram to illustrate the type - a pair of meniscii and a pair of cemented elements, usually in a symmetrical arrangement. The Ross WA Xpress 4/5" actually opens to f3.2. Ian, thanks for correcting me re the 5"/4.5 W/A Xpres, although I'm not sure what difference the correction makes. The VM says that some versions of the lens open wider than the nominal f/4.5. The interesting question is whether Ross intended them to be used that way. Thanks also for the between-the-wars examples of small format cameras with echt Plasmat lenses. I should have been more specific. The VM is very clear that some between-the-wars small format cameras were fitted with Plasmats. Similarly, old Goerz and CZJ catalogs make it clear that Dagors were made for small format cameras. Again, between-the-wars. Note that the Makro-Plasmat is a plasmat by designation, the lens consists of one cell each from a 6/4 plasmat and a 6/4 double Gauss type. Modern plasmat types all conform to Rudolph's original layout, so calling hybrids like the Makro-Plasmat and other things entirely like the f/1.5 Kino-Plasmat (the inner menisci are concave outwards, not inwards) is, IMO, very sloppy language. Humpty Dumpty-style redefinition on the fly, not really legitimate. But there were very few 35 mm cameras on the market before 1946, that's when that segment of the camera market began to grow in a big way. Can you add any post-WW II small format plasmats to the two I found in Cox? I think the f4 restriction on the WA Xpres is due to the maximum opening of the shutters it would fit (Ilex #4 and Compur #3) whereas in barrel, it will open to f3.2, although f4 is marked, the iris on my copies does actually open a little wider than that f4 mark. I don't have any way of measuring with ay degree of accuracy if this wider setting equates to f3.2, but I am happy enough to accept that figure. I don't know of any post-ww2 plasmats on 35mm cameras, it does seem that plasmat types were dropped for small formats post-war, why is a mystery to me. The plasmat design with it's 70 degree coverage would seem to be suited to wider angle lengths such as 35mm, but I can't think of a post-war instance of one and all the early 35mm design are retrofocal types, basically a tessar with an extra element in front to widen the field. I don't get too caught up in names of things, I mean, the manufacturers often used the same name for different designs, so I'm happy enough if we lump all similar designs into a group we refer to as plasmats, after all, what else can we call them? It's like the 4/4 dialyte type, it's been used by so many makers under so many names, but we tend to call them all dialytes, and while that is a gross over-simplification, I don't see what other option we have. The nomenclature is clumsy and only very loosely accurate, but I don't see what else we can do. Excuse my ignorance but what is so special about a plasmat? according to wiki many macro lenses are of the plasmat design. Nothing special, the plasmat type was very widely used for large format lenses, enlarging lenses, process lenses, but appears to have not been uesd for small formats other than a small number of applications in the inter-war period. You know the reason why? Or just because other formats showed to be superior? No, I don't know, the reason for this thread was to ask why. To answer your questions (this post and the one two down from it), plasmat type lenses are widely used as normal (for the format) lenses on view cameras because of their coverage. Early modern LF plasmat types (f/5.6 Schneider Symmar and Rodenstock Sironars) cover 70 degrees at f/22, allowing more movements (displacements, swings) than, e.g., the tessar and dagor types they displaced. Newer LF plasmat types from, in alphabetical order, Fuji, Nikon, Rodenstock and Schneider have greater coverage still. The latest Symmars and Sironars aren't classic 6/4 plasmat types. Coverage isn't an issue for cameras such as 35 mm SLR and rangefinder types that don't allow movements. The Meyer Makro-Plasmat is not a classic plasmat type. Its front cell is a classic 6/4 double Gauss cell: --> (( (|(. Its rear cell is a completely air-spaced sort of plasmat or dagor: (( (( (( <-- Classic plasmats, as shown in the cross section Ian posted, aren't completely airspaced. Plasmat with a capital P is better thought of as a Meyer trade name than as a design type. Lenses made for closeup work (magnification not higher than 1:1) with SLRs are mainly tessar and double Gauss types; not all of the double Gauss types conform to the classic 6/4 layout. Lenses made for photomacrography (magnification > 1:1) are a mixed lot; triplets, tessars, usually reversed, 6/4 double Gauss, some more complex and hard to characterize. One reason there are no plasmat type wide angle lenses for SLRs is simple. Classic plasmats are of normal construction with rear node close to the diaphragm, so short ones interfere with the SLR's mirror. This isn't a problem with rangefinder cameras, but is a killer with SLRs and is the reason that nearly all w/a lenses for SLRs are inverted telephoto (also called retrofocus) types. Ian brought up process lenses. Here the dominant types are tessar, dialyte, heliar, and plasmat. There have been dagor type process lenses, also a few 4/4 and 6/4 double Gauss. Some modern types (some Konica Hexanon GR IIs, later Apo-Germinars) are more complex and hard to characterize. Actually Dan, Apo-Germinars are a bit more complex, originally they were a 6/6 design, then they switched to a 4/4 dialyte type for the longer ones and a different 6/6 design for the others. Thinking about the back focus issue, Symmars have back focus lengths close to their focal lengths. If memory serves me correctly, the 150mm Symmar has a 146mm back focus. That would mean you would need to have a 58mm lens for a 35mm SLR, which was also the case for the early double-gauss/planar types that were 58mm before they tweaked the designs and they became 50mm or 55mm. 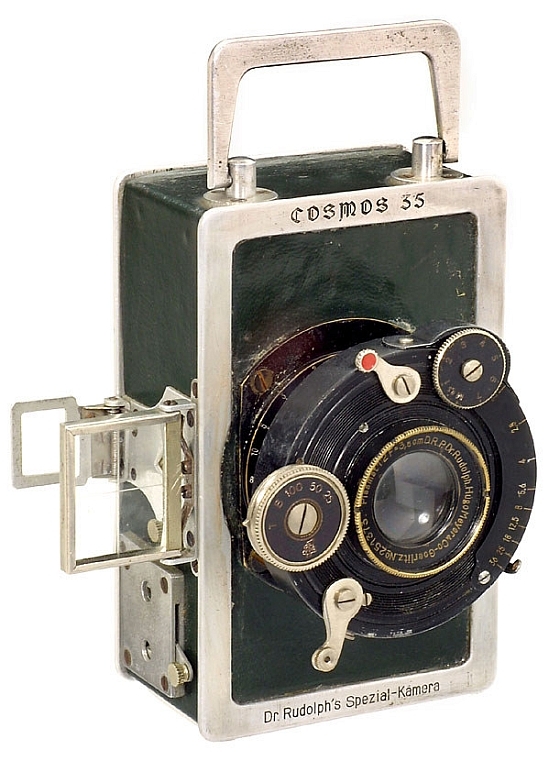 Maybe that back focus issue explains why the plasmat type wasn't used for 35mm cameras? Although you could use it on rangefinder cameras, where Zeiss used the Biogon type which has a very short back focus. That and cost. Most post-WW II rangefinder and viewfinder cameras, both 35 mm and for 120 film, are pretty inexpensive pedestrian little boxes. Nearly all have triplets or tessar types. These are less expensive and, when coverage might be an issue, as with triplets for 6x6 cameras, using a slightly long for the format focal length is less expensive than getting a lens that covers and whose focal length is just right. Hence the little 6x6 cameras with 85 mm triplets. Some of them, like the Ansco Automatic Reflex I have in the closet, were actually fairly expensive. Triplet and tessar and crappy old camera enthusiasts, don't bristle. Most, not all, crappy old cameras were capable of taking quite good pictures when new and used intelligently. The survivors still are. If you want what a Diana does, get one or a Holga, don't get, for example, an old Agfa. If you want an old Diana or Holga, get a Photax. They were dreadful new and still are. In my experience, there is a fair spread of quality among tessar and triplet types. I have two 1930s Bessas in 6x9, one with a Skopar 3.5/105 and one with a Voigtar 3.5/105, both are superb. The Voigtar is a triplet, but from f8 and smaller, you can't discern any difference at all with the Skopar. The better triplets are really fine lenses, but there are also some pretty mediocre ones too, I've had some great ones like the Meyer Trioplan 2.9/50, Schneider Radionar on my Franka Rolfix and the really great Novar on my Mess-Ikonta, but also some not so good ones from makers like Staeble and Roeschlein, I remember a Balda Baldanar on a 6x6 folder that sucked. I hve a Kershaw 6x6 folder with a triplet and that's really good. Same with tessars, I've had great ones like the Skopar on my Bessa and also crappy ones like the Kodak Anastigmat on a Volenda 620. Until the 1960s, the Germans were making cameras to cover all price points and there was a fair spread of quality. We're lucky that we can now afford to own cameras that when new were very expensive. The Zeiss Planar 80/2.8 for Hass, and Nikkor 75/2.8 for Bronica and Makina67, seems like a hybrid of both typical Plasmat and Planar? + the Canon EF 40mm 2.8 STM. Very similar to the Nikkor Makina lens. BTW, the Zeiss Planar 80mm 2.8 for the Hasselblad is more a deviation from the double gauss than a Plasmat/Planar hybrid. There are more examples of that design, the Topcor 58mm 1.8, ser 9900xxxx version, has the same 6 elements, 5 groups solution, with 3 separate elements at the front and the group directly behind the aperture.